Trojan Battery Co., LLC, the world’s leading manufacturer of deep-cycle batteries, today announced the launch of its new line of maintenance-free, true deep-cycle absorbent glass mat (AGM) batteries specifically designed for solar and other renewable energy applications. The new Trojan Solar AGM line is manufactured in the U.S.
Offering a three-year warranty for stationary applications, and tested to an eight-year design life under IEC 61427 standard for solar batteries, this initial release includes a wide range of Trojan Solar AGM models. With its non-spillable design, the new Trojan Solar AGM batteries enable installers to customize the use and position of the batteries in customer applications, and are certified for non-hazardous shipping per U.S. DOT/IATA regulations. The Trojan Solar AGM line of batteries will be showcased at Intersolar Europe this week in Munich at the Trojan Battery booth B1.260. Is there a PV storage solution between lead-acid and lithium ion? The new Trojan Solar AGM battery line extends Trojan’s robust offering of maintenance-free, deep-cycle batteries specifically designed for renewable energy applications. This battery family joins Trojan’s current Smart Carbon deep-cycle flooded batteries which feature Trojan’s proprietary carbon additive that helps reduce the effects of Partial State of Charge (PSOC) or undercharging which is common in renewable energy applications. Operating at PSOC on a regular basis can quickly diminish the overall life of a battery, which results in frequent and costly battery replacements. 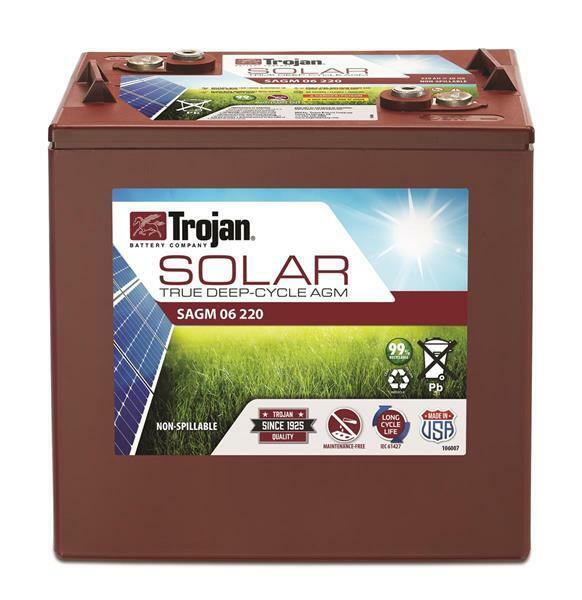 Trojan’s Solar battery line incorporates a wide range of advanced technical features including a robust proprietary paste, advanced plate design and premium separators for overall extended lifecycle, and optimized for total cost ownership. In addition, Trojan’s new deep-cycle Solar AGM batteries are temperature tolerant, shock and vibration resistant and have a low internal resistance for higher discharge current and higher charging efficiency. These features make it the ideal battery for the harsh and demanding environments of off-grid as well as grid-connected systems with frequent cycling needs.